Binsted is, rarely within West Sussex, a place where people living in the parishes south of the A27 can come to enjoy the Park and its surrounding countryside without having to cross the A27. And Binsted as a whole, whether inside or outside the mapped boundary of the Park, is a great place to discover and experience many different aspects of the Special Qualities of the Park - see below. Binsted lies on the gentle slopes at the foot of the Downs – ‘on the southernmost flanks and outliers of the chalk’ (Countryside Agency, ‘Landscape Assessment of West Sussex’). After many centuries of independence, it was joined to Tortington in 1933, but has been part of Walberton parish since the 1980s. Its land is undulating, and slopes towards the sea, with the woods on the higher ground. From a distance, from the south or west, it can appear higher than the Downs. The old parish’s western boundary is the steep-sided Binsted Rife valley, thought to be a glacial meltwash valley formed by water running off the Downs at the end of the last Ice Age. Though only 60 ft deep at Avisford, the valley is a dramatic feature, almost completely hidden until you are within it. The northernmost part is wooded, the central area includes a golf course (with a footpath bridge across the Rife), and the southern part is a haven for wetland wildlife. All of Binsted’s woods, 8 of its houses, and 12 of its fields are within the National Park; its grazing marshes, ancient hedgerows, valley and most of its farm fields, houses and listed buildings such as the 12th-century church, are outside it. Although Binsted's landscape and community is bisected, on the map, by the National Park boundary; it is in fact an integrated landscape, whose natural assets and cultural heritage are found throughout the parish - as much outside the Park as within it. Being bisected by the Park boundary puts Binsted at risk of being destroyed, by being bisected in physical reality too. On 11 May 2018 Highways England proposed, as its Preferred Route for an A27 Arundel Bypass, a route through Binsted. They need to recognize that for major developments, planning guidance says, clearly and repeatedly, impacts must be considered and avoided both within and in the environs of the Park boundary. What Special Qualities of the National Park are there to be enjoyed in Binsted? Reports for the Countryside Agency before the creation of the Park said that the whole area from Walberton to the river Arun (i.e. the whole of Binsted, as well as the western bank of the Rife to Yapton Lane B2132) met the criteria for National Parks. In spite of that the draft boundary included only the main block of the woods, without the outlying copses. Many organisations argued for more to be included. The final boundary included the whole of the Binsted Woods Complex SNCI and its most closely related fields. SQ1: Diverse, inspirational landscapes and breathtaking views. Binsted has many wonderful views of the changing pattern of Binsted Woods and their integrated fields. SQ2: Tranquil and unspoilt places. Binsted feels isolated and enclosed, cut off from modern life by its stream valley, its other boundary streams and its massive woods. The lane is effectively a no through road so there are few cars. It is not really ‘remote’ from centres of population, but this makes the perception of remoteness all the more valuable. The 32 spread-out houses that are within the old parish of Binsted (ie apart from the 6 this side of Yapton Lane which we include in today's wider perceived Binsted community, and apart from Havenwood mobile home park) form a semi-circle linked to, and overlapping with, the curve of the woods. There are historical reasons for this layout – see the next section. Copses in the main stream valleys reach from the woods into the fields. As you move round the parish, the linking shaws and copses first hide then reveal the huge main block of woodland, with the ever-changing shapes of the woodland edges providing many different views. It is ideal for peaceful recreation, as many walkers, riders and bikers know. ... is found in the 250-acre semi-natural woodland of Binsted Woods, and throughout their environs of ancient hedgerows, enclosed fields and marshy areas. Connected to its ancient woodland is an integrally linked network of other special habitats including grazing marshes ponds and streams in the Rife Valley, ancient hedgerows and field trees, and a patchwork of fields from orchid-rich pasture to traditional arable where rare arable wildflowers are sometimes seen. At least as much of this ecological network is to be found in the parish outside the Park, as within it; the important thing is the interconnectedness of Binsted's landscape as a whole, whether inside or outside the Park boundary. A 2003 survey by Walberton Action Group found that Binsted has 112 hedges with a total length of 25,427 metres. 95 of these connect with others, and 35 are ‘species-rich’, some markedly so, such as Copythorn West Hedge, part of the boundary of the National Park. The successor conservation body focussing on studying, understanding and enhancing the area of Binsted (and eastwards from Binsted across to the Arun floodplain) is MAVES - Mid Arun Valley Environmental Survey. SQ4: An environment shaped by centuries of farming. Binsted (including Binsted Woods) is a mediaeval parish landscape shaped by centuries of farming. Binsted’s woods, partially enclosing the northern part of the parish, played an important role in the farming economy. Binsted is historically a peninsula or spit of land. It was cut off from the coastal plain by marsh on three sides; this was the reason why Binsted lane wanders in a U-shape. Within this ‘island’, Binsted’s self-sufficient mediaeval parish, separate until 1933, raised its own taxes and had a poorhouse next to the church. The central fields were farmed communally, and not enclosed until 1606 or 1615, with some ‘strips’ surviving in 1840 (Victoria County History). Binsted has survived with the imprint of its ancient land use on its lane and spread-out houses. Many farming parishes moved their houses into a village centre from the 7th century onwards; Binsted did not. This history, once perceived, adds a feeling of ancientness to the sense of unity and isolation. SQ5: Great opportunities for recreational activities and learning experiences. There are 11 footpaths passing through Binsted of which two are bridleways. They link Binsted, the woods and the National Park to Walberton, Arundel, Yapton, Barnham, and areas further away such as Bognor and the coast. This access from the south and west to Binsted and the National Park is via routes which do not cross any major roads. Three footpaths cross the A27 in the north part of Binsted providing links with the higher areas on the Downs. Binsted's many footpaths through changing scenes and habitats provide these opportunities together with our pub and church, Strawberry Fair and Harvest Supper and other events, B&B, golf course, bushcraft and archery enterprises. There is also a planning permission for holiday lets at Mill Barn, though this is unlikely to be implemented whilst threatened by a possible Arundel Bypass route. MAVES is providing learning experiences for which Mill Ball is making a classroom available. SQ6: Well-conserved historical features and a rich cultural heritage. In addition to its 12th-century church, lovingly looked after, and its 10 listed buildings, Binsted has rich archaeological heritage: two mediaeval tile kilns have been excavated here, one just inside the National Park, one just outside it. Artists and writers have been and are drawn to Binsted, as described in Binsted Arts. Binsted woods (250 acres) and neighbouring Tortington Common (180 acres) are part of a historic large woodland reaching to the top of the Downs. The 1600 map of Arundel Forest, ‘created in name after the Conquest, but probably older’, shows Binsted, both woods and fields, with its 12th-century church, as part of the Forest (information from Heather Warne, author of the Victoria County History article on Binsted). Binsted may have played an important part in administering the Forest. Binsted Hundred, a Saxon unit of administration, was later called Avisford Hundred, possibly named after ‘Aves’, a court which dealt with forest regulation. (‘Hundredhouse copse’, the name of a woodland within Binsted Woods, may record where the Hundred met.) Such courts were held on the edges of a forest once a year to remove pastured animals from the forest for the closed season. Much of the woodland of this ancient forest still remains, extending to the top of the Downs, though cut through by the modern A27. See also History, Archaeology, Folklore, People. SQ7: Distinctive towns and villages, and communities with real pride in their area. Binsted has an active village community who run a variety of Events for the village and the public. One of these is the Strawberry Fair, the main source of income for repairing the fabric of the 12th century church. Since its inception in the 1980s, with up to 1000 visitors each year, the Fair has raised about £100,000, with a proportion of that income each year (a third to a half) going to chosen charities as well as towards the upkeep of the church. Binsted's successful village book, ‘Binsted and Beyond’, was published in 2002 with a Heritage Lottery Fund grant and continues in print. It may be asked, why does the National Park boundary include some of Binsted's homes and countryside, and exclude others? The whole area between Walberton and the River Arun, not just the woodland, in other words the whole of Binsted and more besides, was felt by the Countryside Agency's consultants Landscape Design Associates to meet the criteria. The Countryside Agency appear to have ignored this advice (were they persuaded to leave room for a bypass through Binsted?). The final boundary, which included only the whole of the wooded area and some fields enclosed or nearly enclosed within them, was a tight boundary within a larger area which met the criteria. It will be no surprise then to find that the special qualities of the National Park are, in Binsted, found as much outside the Park boundary as inside it. The experience of appreciating Binsted outside or inside the Park is a seamless one. So it is deeply ironic that the Park designation has caused Highways England's locally ill-informed consultants to start looking, at options for the Arundel Bypass which have even worse impacts on Binsted than the previous Preferred Route. The map above shows the National Park boundary, and Binsted's houses and listed buildings. It also shows two possible versions of the through-Binsted option for an Arundel Bypass being considered by Highways England. 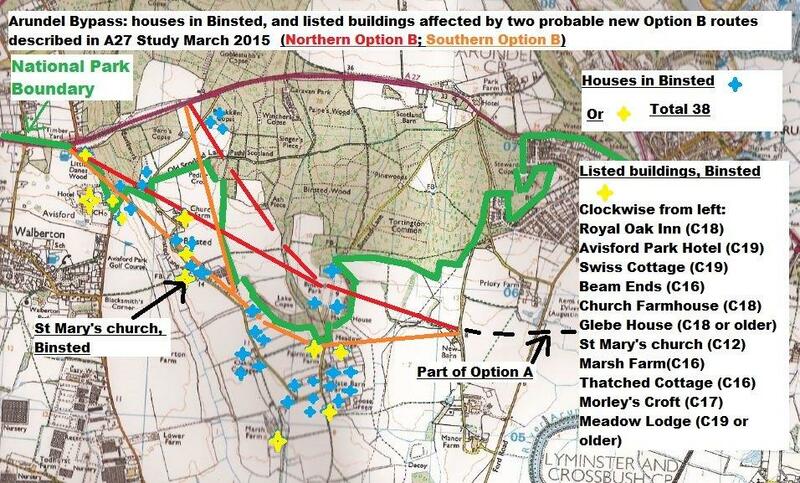 It can readily be understood that either version would be disastrous for Binsted's community, businesses, visitors and countryside. Such severe damage could never be mitigated. Binsted residents and friends are fighting in ABNC to save Binsted from this destruction. For more information click on the ABNC logo, to link to the ABNC website www.arundelbypass.co.uk.